Of all the celebrations marking the 400th anniversary of Shakespeare’s death last year, for many of a certain age none will have seemed so of its time or laced with such nostalgia as the reappearance of the legendary Argo Shakespeare recordings. 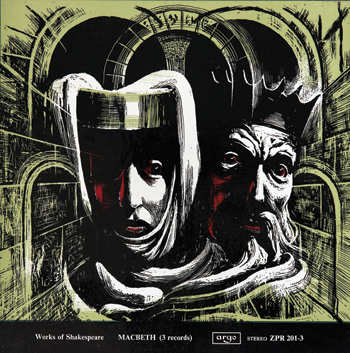 Remastered and issued on CD for the first time in a 100-disc set, complete with a 224-page booklet and sleeves featuring Arthur Wragg’s evocative, period-defining pen-and-ink illustrations, the Argo Shakespeare originally appeared on LP and for successive generations served as the first introduction to the playwright’s work. Launched in 1957 as an aid for “actors, drama societies and schools”, the collection aimed for a completeness that had never before been attempted. Omitting The Two Noble Kinsmen (a slight later shared by the BBC’s ‘complete’ broadcasts from 1978-85) it recorded 37 plays together with the four -narrative poems and 154 sonnets in their entirety. It was a historic undertaking. 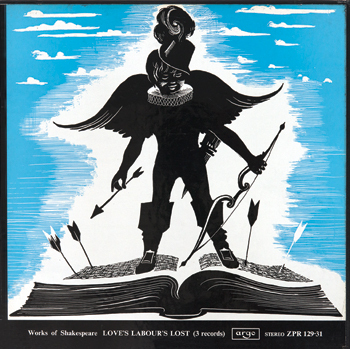 More than half a century after its last -recordings were issued in 1964, the Argo Shakespeare (named after the small, independent record label on which it was originally released) remains a unique venture. Stage presentations of all the plays and poems had to wait until as recently as the Royal Shakespeare Company’s Complete Works festival in 2006-07 to be seen together in a theatre. The project had been conceived in 1951 by the British Council, keen to capitalise on the success of that year’s morale-boosting Festival of Britain and to exploit the affordability and expanded playing time of the newly popular long-playing vinyl record. At around 23 minutes per side, the LP format far exceeded the five-minute capacity of 78 rpm records; more than ample for the recording of complete plays. The project almost never was. Plans to assemble an in-house repertory company stumbled at the first hurdle when the Shakespeare Memorial Theatre and the Old Vic (which had produced the first full-length Shakespeare play on disc in 1953 on the HMV label) were unable to guarantee the same actors over the full period of the project. Undeterred, the British Council turned to George Rylands, who had recently directed the first television broadcast of Troilus and Cressida and was at the helm of Cambridge University’s Marlowe Dramatic Society. With estimates that professional casts would cost £1,500 per recording proving prohibitively expensive, Rylands’ amateur company, able to push the budget down to £500, became the bedrock of the project. But with the British Council nervous about his plans to include professional actors, Rylands was obliged to offer reassurance by funding the first recording himself. The success of King Lear – featuring William Devlin in the title role, Jill Balcon as Goneril and Prunella Scales’ Cordelia – heralded the beginning of a project that aimed to stress the poetry and meaning of Shakespeare’s words without losing the dramatic qualities of his plays. It’s the very centrality and clarity of the voice that lends the Argo recordings their abiding distinctiveness. Scales was one of a number of young actors at the beginning of their careers heard throughout the recordings alongside their student peers in the Marlowe Dramatic Society – a veritable nursery of talent. 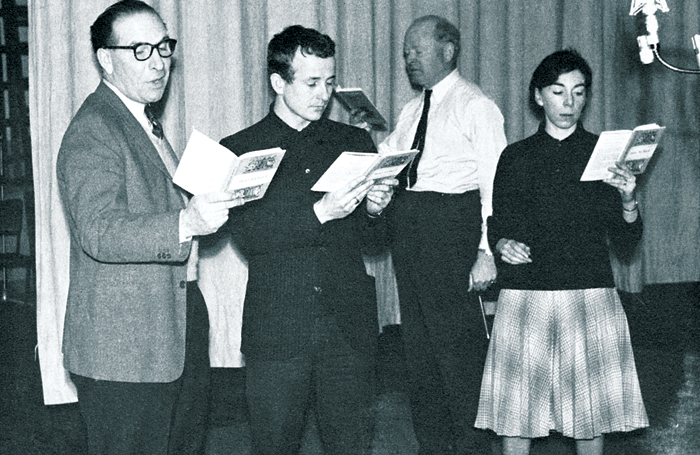 Among other notable names in the making found here are Dorothy Tutin (her 1961 Viola capitalising on her acclaimed appearance in the role with the RSC the same year), Derek Jacobi, Ian McKellen, Corin Redgrave and Barbara Leigh-Hunt. A generation of Young Turk directors-in-waiting – Peter Hall, Trevor Nunn, John Barton, Toby Robertson and John Tydeman (a future head of the BBC Radio Drama department) – are also to be found in performing roles. Established names, too, lent their own -gravitas, notably in an effervescent Much Ado About Nothing in which John Gielgud’s Benedick pitted against Peggy Ashcroft’s Beatrice. Michael Hordern’s Prospero and King John and a Lady Macbeth, Cressida and Volumnia (Coriolanus) from Irene Worth also proved high-watermarks in the series. The recordings paid unwitting witness to a handing over from an established generation to a new influx of talent. Above all, the recordings offer, as if in aspic, a surprisingly resilient snapshot of an era of Shakespearean production – and speech – in transition. The emphasis on the quality and clarity of the verse speaking directly harks back to a more formal tradition that was already being diluted and transformed by the freer attitudes and less hidebound accents of the wider cultural transformations of the 1960s. It was also a decade in which the sotto voce television and film voice first began to insinuate itself into theatre. Certainly, compared to the BBC’s television canon – large swathes of which suffer from astonishingly garbled speaking – the Argo series remains direct and coherent. If anything, its capacity for clarity, poetry and drama seems heightened by the remastering. Listened to on headphones, the recordings have a pristine quality that can’t always be guaranteed on stage (whatever other -qualities Benedict Cumberbatch’s 2015 Hamlet at the Barbican had, diction was not always one of them) or on television – the Royal Exchange’s King Lear broadcast by the BBC over -Christmas was bedevilled by voices straying away from hidden microphones. Its completist ambitions aside, there was nothing intrinsically new about the Argo Shakespeare. Snippets of the canon had been committed to disc from shortly after Thomas Edison developed his Phonograph in the 1880s, with the great Victorian actor Henry Irving recording speeches from Richard III and Henry VIII on the new-fangled novelty. And he was not alone. His American contemporary Edwin Booth also committed Shakespeare to posterity in historic recordings, as did Ellen Terry, Herbert Beerbohm Tree, Frank Benson and Johnston Forbes-Robertson. Central to the Argo project was a notion of accessibility ahead of its time. Focused on the voice rather than on other more distracting, fashion-prone production elements, the recordings have aged remarkably well. Hearing them again is to be reminded that how you speak Shakespeare matters and goes to the heart of intelligibility (a quality ignobly illustrated by Michael Fassbender’s recent and virtually unintelligible Macbeth). It also touches, intriguingly, on the -assertion by a number of scholars that the later, longer plays were written to be read as much as to be played. Against the odds, the Argo Shakespeare managed, Frank Granville Barker approvingly noted in a review of the first stereo releases in The Stage, to “finally transport the ‘wooden O’ of the Globe Theatre to the ‘plastic O’ of the long-play record”. By the project’s conclusion in 1964, in time for the quarter-centennial of Shakespeare’s birth, the British Council had spent £25,000 in total and already banked sales receipts of around £14,000. Even in a time of digital excess, the Argo Shakespeare is a project unlikely to be repeated.